[ACT](VC) Limit Break 5 (This ability is active if you have five or more damage):[Counter Blast (4) & Soul Blast (6)] Choose up to three of your opponent's rear-guards, retire them, and draw a card for each unit retired. 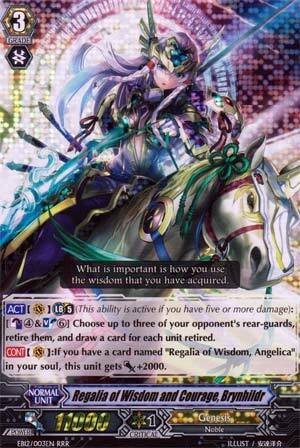 [CONT](VC):If you have a card named "Regalia of Wisdom, Angelica" in your soul, this unit gets [Power]+2000. It's been a good run. We now return to your regularly scheduled crap for the week. Brynhildr is an alternative Crossride to Angelica. But what can she do alone? Well, she's an ULTIMATE Break, and your reward for being near death is to Soulblast 6 and Counterblast 4 to retire 3 of the opponent's rear-guards and draw 3 cards. I'm not impressed. Retire 3 and draw 3? I could combine Chaos Breaker Dragon with Infinite Zero and accomplish pretty much similar results. Hell, I'd be able to do it SOONER and with more reliability owing to not needing to wait until I'm almost dead. The 13k base doesn't really do it justice either owing to every new deck being able to hit 18k+ columns as a secondary gambit. And if the intent is to combine this with Angelica, who already costs 3 soul, what you're looking at is a whopping NINE soul and little flexibility on how to obtain said soul, owing to her Counterblast demands meaning you can't spend any to soulcharge more, short of healing. Not to mention there's now no room for any actually interesting units owing to everything being needed for dedicated Soulcharging. This is no Minerva and never will be. It's too expensive for what it is and not reliable enough. What the heck? Angelica's 2nd Cross-Ride? And the skill is an Ultimate Break and... It nearly needs the same costs as a Mega Blast? ...Screw it, I'm calling this kind of skill an Ultimate Blast. So, what does this Ultimate Blast do? Hard retires 3 of your opponent's rear guards and then draws a card for each one? ...That's... Pretty good, actually. I think it's a +6 for that kind of skill. As far as the Ultimate Break goes, it's not bad, better than Vermillion's Crossride, on par with Platnia Ezel, actually. Brynhildr here has two problems though. Minerva and Yggy. Both of which are flat-out better than she is. Really good for a budget Genesis deck, but if you can get Minerva or Yggy, they're just better. This quite possibly could be the worst crossride unit that has ever been made and was released completely in the wrong meta. This should have been a Set 14 card and never should have been an ultimate break. The cost is so high for what you get, to retire 3 of your opponents units and to draw three cards is okay but you have to be at limit break 5, counter blast 4, and soul blast 6.....doesn't really scream balanced and nor does it fit the normal theme of Genesis. I really feel every time Bushiroad makes a unit for Genesis that retires units it is completely unbalanced or just terrible. The one thing that I do like about this card that it is a crossride to a really good unit. This unit though is just like the red headed step child of the Genesis family and there are way better units to play around with. My true disappointment with this card is that it was printed as a RRR in the extra booster when it should have been printed as a RR but more importantly it took a spot of an SP, immense sad face.